The instructions that are provided here apply to the process that you can follow when you run PA Server Monitor for the first time. Most of the screens that you will encounter in the Startup Wizard are standard configuration dialogs that are available to you from PA Server Monitor, so you can always change the configuration for your setup later. When you see the Welcome dialog, press Yes to enter the Wizard. Press No to return to PA Server Monitor (you will have nothing configured if you do this and you will have to set up servers and other monitored devices manually.) If you press Yes you will see the next screen shown, Configure Email Notification. 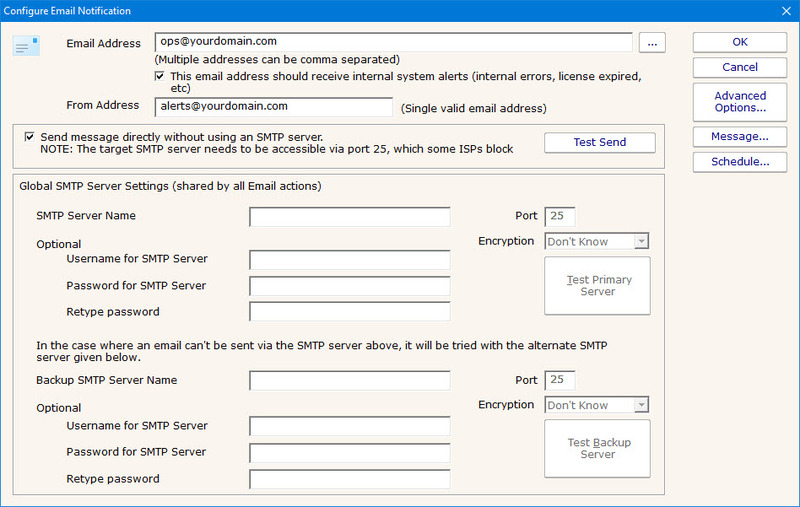 Refer to the help page Send SMTP E-Mail for directions. Select OK when you are finished with the Configure Email Notification screen. The next screen helps you configure a Write To Text Log File action which the monitors can use to record human readable events that happen. Select OK when you are finished with this screen. The Smart Configuration screen will help you set up many servers and devices for monitoring. You can simply paste a list of machine names or IP addresses into the box for configuration to target those servers/devices. Optionally, you can press the Discover button to have the product do a Ping sweep to try and find servers and devices within a subnet. The program will allow you to use the Automatic Configuration or the Customize and apply specified monitors options to configure your monitors. More information on Automatic Configuration. Refer to the help file entry labeled Smart Configuration for specific instructions for this screen. After you have entered the necessary parameters, select the button labeled "Begin the Smart Config Process". You will then see the next screen. The "Smart Config Action Selection" lets you customize the Actions that the Smart Configuration process will create for you for every Monitor that is created for a server or device. When you have completed your selections, select OK. You will see a progress dialog as each server or device is checked and default monitors created. The screen labeled "Smart Config Process" shows you what PA Server Monitor is doing to set up the initial set of Monitors for your systems. When it is in process the centered button is labeled Cancel and you can stop the process by selecting it. When the process completes, you will see text as shown in the screen shot and the label on the button changes to Close. Select Close at this time in order to progress to the end of the Startup Wizard. The final screen will display helpful information for you, and confirms the end of the Startup Wizard. Press OK to continue. At this time, the Console of PA Server Monitor will be displayed, configured with the Monitors and Actions that were automatically configured for the servers that you selected. These monitors are just defaults -- feel free to change or delete them.